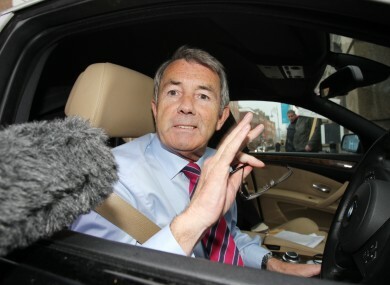 INDEPENDENT TD and former minister Michael Lowry has lost a High Court appeal against broadcaster and journalist Sam Smyth over allegedly defamatory comments made against him. High Court president Justice Nicholas Kearns rejected Lowry’s application for a summary order under the Defamation Act 2009, after Lowry had claimed Smyth had no arguable defence for the statements. Lowry had originally brought the case to a Circuit Court in February of last year, but his application had been rejected on that occasion. Lowry had contended that language used by Smyth on an episode of TV3′s Tonight with Vincent Browne on June 24, 2010 could be understood to mean that Lowry was a thief, corrupt, dishonest and an untrustworthy politician unfit to be a TD or minister. In that TV3 exchange, Smyth said Lowry had been caught “with hand in till” and that he had “allowed the biggest business in the country to pay for the refurbishment of his home”. He also said an article published in the Irish Independent the previous month – which included the line, “the total value of all the property transactions involving Mr Lowry was around stg£5 million” – would be interpreted as indicating Lowry had unlawfully benefited from property transactions by awarding a mobile phone licence to Esat while Lowry had served as Minister for Communications. Lowry had sought a declaration that the statements were false and defamatory, and sought corrections in respect of both publications and an order prohibiting those statements from being published again, as well as summary relief against Smyth. The court was told that Lowry had written to Smyth on July 30, 2010 to seek an apology and correction from him, but that Smyth had declined to do so. Smyth claimed, in response, that the words he used were a fair and reasonable publication on a matter of public interest. His Irish Independent article needed to be read in conjunction with the proceeding paragraphs which he said referred to the investigations of the Moriarty Tribunal and its findings of September 2005. In respect of the words broadcast on TV3, Smyth said his words related to the fact that the lengthy trail of investigations into Lowry’s affairs – culminating in the Moriarty Tribunal – emanated from the fact that Lowry was found to have engaged in tax evasion and to have lied about his business and financial affairs. In his ruling, Justice Kearns noted that although the wording of the Act – which provides for a correction to be broadcast or carried – appeared to be addressed to newspapers or TV, Lowry had not joined either Independent Newspapers or TV3 in his application. He noted Lowry’s argument that Smyth’s arguments relied on the findings of the Tribunals, which themselves are inadmissible in other proceedings, and Smyth’s defence that Lowry’s inferred meanings were incorrect, as well as his claim that the statements were true, and also that Smyth was entitled to express an honest opinion on matters of public importance. Justice Kearns said the fact that tribunal findings were inadmissible in other courts did not mean that could not provide a “roadmap” for other persons with an interest in its inquiries. He said that Lowry himself had admitted that he had not paid tax on Dunnes Stores’ €395,000 refurbishment of his home, the subject of the original TV3 remarks, and that Smyth did not need to rely on Tribunal findings to argue this point. With regard to the Irish Independent story, the judge said Smyth could have argued that pointing out a tribunal’s investigations into a possible link between the property transactions and Lowry’s awarding of the phone licence. The phrase “hand in till” could have referred to the bills inappropriately picked up for Lowry’s benefit by his business interests, and his failure to pay tax on that amount, the justice said. “It seems clear that the defendant has a good arguable case in respect of both publications,” Justice Kearns said. Email “Lowry loses High Court defamation appeal against Sam Smyth”. Feedback on “Lowry loses High Court defamation appeal against Sam Smyth”.